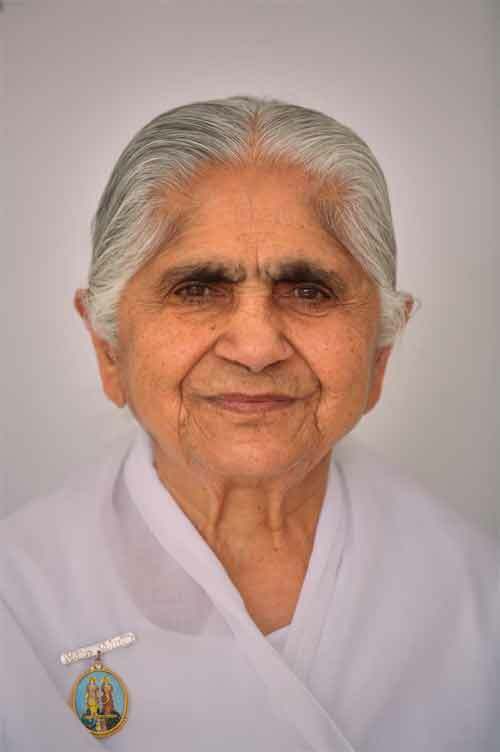 Dadi Janki (born in 1916) is the spiritual head of Brahma Kumaris spiritual organization. Dadi Janki quotes is a collection of thoughts and sayings of Dadi Janki, a true Raj Yogi. This collection of 108 quotes are mainly from newspapers, books, magazines and talks. When your mind creates upheaval, practice self governance. As you learn to rule your own thoughts with patience and kindness, you will better serve your aims. Sometimes you must burrow to find the good qualities in your nature that have gone underground and then coax them to the surface. Stopping for a moment and being silent can bring the steadiness you need for this task. Self respect is not a matter of what you are doing in your life, but rather of how you are doing it. It requires that you bring quality and virtue into each action, whatever that action maybe. Gentleness is not lack of strength but a quality which doesn’t disturb, doesn’t push, yet knows its own power. To be of real help without taking root in someone else’s mind requires great gentleness. See and understand without either willfully interfering or creating dependence. Sweetness is a virtue that searches for the good in every person and situation. At its heart is the conviction that there is always something positive to be found. You simply need to have the patience to discover it. When you notice weakness in another, aim instead to recognize a strength. The awareness that everyone has value will allow you to shift your focus. Observing what is wrong, if done with humility, can point the way to something right. React less, respond more. As you learn to tell your mind what to do, old ways of thinking and doing will change. Because we understand the value of money, we take care not to waste it. If we valued time, energy and positive thoughts, we would likewise economize. The result would be a life full of meaning and purpose. Integrity is matter of considering the consequences of every action and of never being drawn mindlessly into anything. The ability to live according to your values, in an unwavering way, depends on how well you have understood your spiritual identity. Cultivating that inner state of dignity is the basis of spiritual power and it is this power that is most needed in the world today. Be merciful and forgive your own self…and with love, forget the things of the past and move forward. Then you will be able to have real feelings of mercy and love for others. This is the way to truly be of help to others. If your companion is God, then, even if you are alone, you will never feel lonely. Happiness will be yours whether you are with other people or not. God’s love produces a variety of such magic. It enables us to interact with love and co-operation; it makes us into sources of mutual inspiration. With worldly love, there is sometimes the concern that this is going to interfere with one’s career or studies. But love for God only enhances your ability to perform, on all levels. The basis of self-respect is the faith that God loves me. Through this experience, I will be able to start loving myself. By studying God’s virtues and incorporating them in my daily life, faith in my own inherent worth is enhanced. We are living in an era when those who turn their minds within, to the inner self and to God, can truly come together, in a new way. With courage and determination, we can access and ocean of peace, love, happiness and power that transforms the way we see ourselves and others. The process of renewal is simple. Through time, cobwebs of illusion covered our eyes; now we need to be like the spider that swallows its own web. We need to gather in the threads of our old ways of thinking and feeling, recognizing that these are no longer serving us as we had wished. Live in such a way that love informs every action. Contentment and good feelings towards others should remain constant. With no expectations from others, there is no frustrations. Then we become free. We thought we could find happiness outside of us, that we could live from outside to in. We succeeded up to a point, but our success eventually became self-defeating. It enabled us to dig an ever-deeper trap for ourselves. As long as our desires were satisfied, we felt encouraged to continue to look for satisfaction in an extraverted way. This created a vicious circle. Wellbeing became more and more based on things outside of us, which are never stable. Consequently, insecurity and worry increased. We became trapped in a web of physical dependencies and addictions. Then we became afraid, in case we should lose the things we had come to depend upon. Finally, when we actually lost them, as happens sooner or later with everything physical, we suffered a lot internally. Today, many find themselves imprisoned in worry, fear and sorrow because of such misunderstandings. It is though the things of the outer world have been allowed inside, taking a hold where they don’t belong, binding us to them and depriving us of our ability to be ourselves. Suffering indicates the presence of misapprehensions of this kind. Determination leaves no gap between thought and action. Calmness and tolerance act like air conditioning in a hot room. They increase everyone’s efficiency. When you’re shown disregard, check yourself. If you’ve done nothing wrong, and your attitude is well-meaning, understand the situation as a test of your ability to remain beyond the judgment of others. Respect for another means offering criticism only where there is the strength to withstand it. People will naturally start trusting you when they see you dealing with situations in a reliable and consistent way. An even more powerful way to gain the trust of other is to let them feel your trust in them. Your thoughts create your feelings. To save yourself from useless and painful feelings, don’t think about useless or negative things. If you want to change your behavior, focus on the thinking which causes it. Thoughts are like seeds. From them grow your attitudes and in turn, your actions. When you build a house, every brick counts. When you build character, every thought counts. So think constructively. A humble person dismisses nothing, recognizing that whatever life presents needs to be respected. Inside even the smallest things there is often enormity. Being humble does not require you to give of yourself indiscriminately. Have the wisdom to know the value of your inner resources and to give accordingly. Honesty is most powerful when it involves not simply speaking your mind but being true to the best that is within you. Flexibility means being able to make problems into teachers. Just as you should never seek to control anyone, never allow anyone to control you. As important as not giving sorrow to anyone is not taking sorrow from anyone. Free yourself from the crisis that you create through your own negativity. There are so many external crises, you can’t even count them. There is nothing you can do about that. But the crisis you create in your own mind, according to the quality of your thoughts – at least put a stop to that. When the mind is strong, external difficulties stay external – they do not shake me inside and rob me of my stability. The mind stays peaceful, free from sorrow and worry. Internally, people do create many difficult situation for themselves. Arrogance, for example, makes you feel disrespect and causes you sorrow. Arrogance brings a desire for regard and respect and when you don’t receive these, you feel it to be an insult. If I give from the heart, and don’t have arrogance, I won’t have such feelings. If I have good virtues and my actions are good, my fortune will also be very good. Victory is about being victorious over our own weaknesses. Being aware of your true identity leads to enthusiasm and hope and you realize that with God as your companion victory is your destination. Remain in the awareness of who you are and the light of the soul remains constantly lit. Sit with God during sunrise and you will receive a great deal of love and power. With constant connection with God all becomes easy. Make God your constant companion and then come into relationship and connection with others. You can then be truly loving. Be the flower that shatters the stone. Do not wilt in any situation. Always be cheerful. Real success means experiencing internal progress. I need to be a mother to my mind, teaching it to think the right kind of thoughts. Even when everything is going well, I need to train the mind. Taking one positive thought every day and spending time with it brings good results. This training makes the mind obedient at the time of need and allows me to be positive even in the most negative situations. When we don’t achieve success immediately, we sometimes get tempted to opt for a short cut. Although we might achieve something temporarily, in the long run it won’t be beneficial and sometimes has the opposite effect to the one we desire. Whenever I am faced with a situation that I feel is too big for me to tackle, I need to take a step back and loot at it from a different angle. I need to have faith in my inner strength and remember that every situation has something to teach me, if I am willing to learn from it. Only when I have the faith and pushy myself to achieve will I be able to grow. Openness to learning brings progress. The one who is constantly full of enthusiasm inspires others. Whenever I encounter a difficult situation, I need to make a special effort to remain free and light. The more enthusiastic I am, the more progress I will make. My attitude will inspire others, too. Every task is easy or the one who is able to co-operate. Working together is the best way to achieve success. I need to recognize that everyone has his or her individual talents, and when I am able to connect with them, we can work together to complete the task. To respect other people is to understand and appreciate their unique qualities. I need to understand that every person around me is different; everyone is unique and has amazing qualities and talents. When I look at others in this way I no longer expect them to change according to my wishes, but instead find that I respect them for who they are. The best way to true happiness is service to others. When we have respect for others, we create a positive environment in which they can strengthen themselves and grow. From trust, love begins to grow. The one who lives a simple life is free from pain. Free yourself from the crisis that you create through your own negativity. The crisis you create in your own mind is according to the quality of your thoughts. Live in such a way that love informs every action. I have learned to live this way, and as a result, nothing disturbs me. My contentment and good feelings towards others remain constant. I have become free. The power that allows me to live like this comes from inside. I do not look for it from the outside. That is why I stay free, with no expectations of others, and no frustrations. Everyone can live this way. It is very natural way to be. However, it requires letting go of certain beliefs and habits that drain us of this strength, and interfere with our ability to love. Sometimes these have become deep-seated within us, such that we are not aware of their presence. We are living in an era, when those who turn their minds within, to the inner self and to God, can truly come together, in a new way. With courage and determination, we can access an ocean of peace, love, happiness and power that transforms the way we see ourselves and others. It is the duty of other people to insult and defame you. It is your responsibility to not be affected by what they say. My wish is that as many as possible, in the human family, should receive their own inheritance of peace, love, happiness and power from God. These are the inner resources that enable us to experience a good life, free of negative thoughts towards the self or others. Happiness is a treasure. It nourishes the soul and gives us energy and enthusiasm in life. When we look for it outside of ourselves, it will always be temporary. We have to learn to create it internally. The way to do that is to create pure feelings within, based on inner truth, love and trust. To inspire means to fill others with enthusiasm, confidence and creativity. When we are inspired we feel truly alive! We certainly take inspiration from the presence and words of exceptional spiritual teachers. The word “inspire” also means to “breath into,” which is about our own responsibility, to take advantage of what we hear, of the atmosphere and energy around us, and shared wisdom. When I talk about seeing the Light of God, I do not mean seeing a flash of light. When the third eye of wisdom opens, it is also called light – the light of knowledge and the light of understanding. That light allowed me to remember – that is, to recognize – my own true Self and my own true Parent. Enthusiasm is the master key to feeling great. It keeps the self extremely positive beyond the pull of negativity while simultaneously making others feel uplifted too. To develop enthusiasm, have faith in the goodness of life and in the original goodness of the self and others. Remind yourself of your inner peace and you will have a greater capacity to find solutions. Observing what is wrong, if done with humility can point the way towards something right. To maintain self-respect don’t expect anything just accept others. The power of silence allows you to serve the world. When I am simple I never feel busy and can be available and flexible. Determination leaves no gap between the thought and the action. When a relationship is not working, it is usually because there are needs and expectations that are not being met. There might be so much anger or hatred that your only desire might be just to run away from it all. However, this is not a solution! It merely reflects your lack of understanding about where the real problem lies. The root of all needs and expectations is an unfulfilled spiritual desire. Satisfy your spiritual desires through the practice of meditation and you will be able to interact successfully with anyone. We must learn to bring spirituality into our relationships. Others will learn by our example. It is a way of inspiring and uplifting each other. A major obstacle to spiritual progress is one’s own negative nature. The root cause of this kind of nature is limited consciousness. This root has to be eliminated completely because obstacles that arise from a negative nature will prevent you from taking power from god. Power from God is received through the awareness and faith that God belongs to you. A negative nature could destroy even this faith. Recognizing the root of the problem helps to transform it. Limited thinking should simply not be tolerated. There should be total cleanliness inside. For this you need to be very honest about the obstacles you are facing, because it is easy to deceive yourself. Limited thinking will be transformed when you spend time in the awareness of your true nature of peace and in being of help to others. Love, purity, peace, wisdom the more you think of these things the more you will become them. Weakness blown out of proportion in yourself or in others invite negative thinking. They will destroy you. Learn to shift your focus. Instead think: Though I am not yet pure, I want purity, God is leading me to my destination, so I will definitely become pure. I will not become pure unless I think about it first. When you build a house, every brick counts, When you build character, every thought counts.